The Gallipoli campaign was an amphibious landing in the Dardanelles Strait in modern Turkey, that sought to knock the Ottoman Empire out of WW I. The landings were exceptionally daring for the time, but they failed to achieve their objectives. The Gallipoli campaign lasted from April 1915 to January 1918, it cost tens of thousands of lives and it was was regarded as a complete failure for the allies. Why did the allies fail to achieve their objectives? 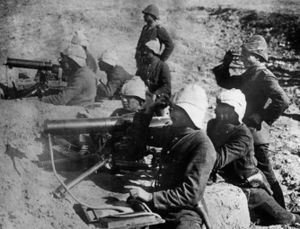 The Gallipoli campaign was hampered by poor planning, inadequate intelligence and stubborn Turkish resistance. The First World War, began in the Autumn of 1914 when the German army invaded first Belgium and then France. The pushed on to the River Marne, only a short distance from the French capital and probably victory. The German advance was halted by the French army at the First Battle of the Marne. The entire might of the French army was required to beat back the German advance. The Allied counterattack also came to a halt and by the winter of 1914, the war on the western front had become a bloody stalemate. The situation on the eastern front was somewhat similar. In the autumn of 1914, the Russian army had invaded Prussia from the Baltic States. Two huge armies poured into the east of Prussia. The German army under Ludendorff and Von Hindenburg defeated these two Russian armies at the Battles of Tannenberg and the Masurian Lake. The Germans pushed the Russians back but they could not deliver a decisive blow. The result was that by 1915, the eastern front was a mirror of the western front, when huge armies fought a war of attrition, with huge casualty figures. The Ottoman Empire was the dominant power in the Middle East, but it had been virtually pushed out of the Balkans and was widely seen as a power in irreversible decline. The Ottoman government had allowed German ships to pass through the strategic Dardanelles and into the Black Sea. This was seen as an act of war and the Allies declared war on the Ottoman Empire. In response, the Ottoman Sultan declared a Jihad or a Holy War against the western allies and Russia. A Russian invasion of the eastern provinces of Turkey was defeated but the Turks could not press home their success. They also managed to limit the British advances in the Persian Gulf. However, the Ottoman Empire conflict with the allies had reached a stalemate by early 1915. The British and the French were appalled by the bloody battles on the western front. They wanted a way that would allow them to attack the Central Powers and in this way to provide some relief for the hard-pressed British and French troops in Flanders and Northern France. The British suggested that the allies use their naval superiority to inflict a decisive defeat on the Ottoman Empire. The idea of seizing the Dardanelles Straits was soon mooted after the Ottoman Turks joined the war on the side of the Central Powers. The British believed that their navy, by far the strongest in the world would be able to land a decisive blow against the Turks. The British navy argued that the allies land a large force of soldiers on the Straits. They would then be in a position to launch an attack on the Ottoman Capital of Constantinople. Another one of the objectives of the campaign were to secure a sea route to Russian and to protect its southern Black Sea flank. It would also allow the western allies to supply the Russian army with badly needed arms and equipment. The British became convinced that any landing in the area of Constantinople, could lead to the Turks withdrawing from their alliance with the Central Powers. The Turkish Empire had arguably been in decline since the eighteenth century and many of the western powers believed that any attack on it would result in its final destruction. Winston Church who was Lord of the Admiralty had great expectations for the assault at Gallipoli, he believed that if the allies seized the Dardanelles that they could open up a new front in the Balkans and even force the Austro-Hungarians to sue for a separate peace and this would lead to the break-up of the Central Powers. The French agreed to the plan and they contributed a significant sized force to the attack. However, the operation at Gallipoli was a British Empire undertaking. Apart from sizeable British army units and naval forces, much of the invasion force was composed of units recruited from the Empire. Many of these came from Australia and New Zealand and they became known as the Anzacs. The campaign began with a failed naval attack by British and French ships on the Dardanelles Straits in February-March 1915. Bad luck meant that the Allied expedition was discovered by the Turks. They mined the Dardanelles as the allies approached and they destroyed several vessels. The Turks alerted by the naval attack began to pour reinforcements into the area. In the wake of the failed naval attack, preparations began for large-scale troop landings on the Gallipoli Peninsula. The British War Secretary Lord Kitchener appointed General Ian Hamilton as commander of British forces for the operation. 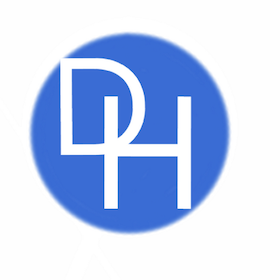 Hamilton had under his command, a very diverse army, he had soldiers and marines, from Australia, New Zealand, and the French colonies along with British Regiments. The allies assembled for the invasion on the Greek island of Lemnos. The Turks boosted their defences in the Straits. The defence of the Dardanelles was conducted by the German general Liman von Sanders. He predicted that the allies would launch an amphibious operation and he placed the troops at the points in the Dardanelles Strait. He advised the Ottoman High Command to station Ottoman troops along the shores of the Straits, one point he selected was the Gallipoli peninsula. This was to prove correct and it was this narrow strip of land jutting into the sea was the allies prime objective. On the 25th of April, 1915, the Allies landed their forces on the Gallipoli Peninsula. Despite suffering heavy casualties, they managed to establish two beachheads. The first was at Helles on the southern of the Peninsula. The other beachhead was at Gaba Tepe that faced the Aegean Sea. Many Anzacs landed here, so many that it came to be called Anzac Cove. The Turks proved to be stubborn fighters and fought for every inch of the Peninsula. After establishing their beachhead, Allies made little progress. The Turks sent troops from other fronts to join the battle. There was a bloody stalemate and thousands of men on both sides died. Both sides fought heroically and often fought to the death. The Allies made landed more troops on the 6th of August at Sulva Bay. This coincided with an attempt of the Anzacs to break out of their beachhead at Anzac Cove. The amphibious landings at Sulva Bay caught the Turks by surprise and the Allies met little or no opposition. However, the Allied commanders did not press home their advantage and they dug in, rather than advance and this allowed the Turks, under their commander Mustafa Kemal, to reorganise and counterattack. 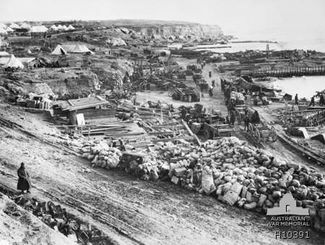 Sulva Bay was probably the best chance that the Allies had of defeating the Turks at Gallipoli. As the months wore on and as Allied casualties steadily mounted in the Gallipoli Campaign, Churchill, and Hamilton, asked the British High Command to ask for up 100,000 men. The Secretary of War could only afford some 25,0000 men. Hamilton and Churchill wanted to continue the fight. However, as the operation had become a stalemate, the British government decided to end the operation. Hamilton was opposed to any evacuation as it could lead to massive casualties. He was replaced by Sir Charles Monroe, and he began plans for an evacuation. He oversaw the evacuation of over 100,000 troops. The evacuation took place between December and January 1915-1916. The withdrawal was carried out in an orderly fashion with only limited casualties. Exact figures are unknown but it seems that some 46,000 allied troops died and almost 180,000 were wounded out of a total force of just under half-a-million men during the campaign. The Turks suffered rather more casualties with some 65,000 killed and 200,000 wounded. The Allies were stunned by the failure of the Gallipoli operation. It led to the resignation of Winston Churchill and almost the end of his political career. The campaign was poorly planned and even under-resourced. The commander at Gallipoli, Hamilton, had only five divisions and they had had very little time to train together and this led to a dangerous degree of confusion. These problems reduced the likelihood of success at Gallipoli. It is normally believed that an attack force had to have a clear superiority in numbers and this was not the case at Gallipoli. Then there was the issue of geography and terrain. The terrain was such that it slowed down the landings and the Allies subsequent attempts to advance inland. This is indicated in the observations of many Australian officers who frequently ‘complained about the choice of the battlefield.’ There were also severe logistical problems and they were not resolved until much later in the campaign, with the recruitment of porters and workmen from Malta and Egypt. 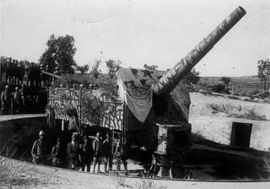 The Allies had failed to anticipate that the Turks would be able to fire on them when they were landing and this meant that they did not seize their objectives early on during the campaign. Then there was the strategy adopted by Sanders, he refused to adopt a rigid system of defence and instead stressed mobility. He split his forces into three groups in order to quickly respond to any landing. 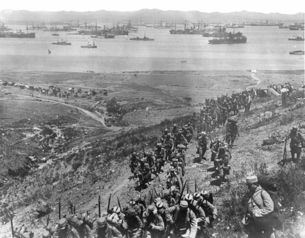 Sanders then recommended that the Turkish forces built defences on the heights surrounding the allied beachheads and this meant that the allies could not break advance inland. However, if the German had listened to Colonel Kemal, (later Ataturk) who commanded the 19th Division, the allies could have been decimated. The future founder of Modern Turkey had predicted the exact areas where the allies would land. Another factor in the failure of the Allies at Gallipoli was a lack of good intelligence. 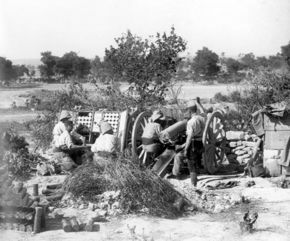 More than one Allied commander complained that they were unsure of what the ‘situation was on the ground.’ The allies did have one chance to grasp some advantage from the Gallipoli landings and that was at Sulva Bay, if the Generals had been more aggressive, they could have altered the battle in their favour. Then there were the western allies continued underestimation of the Turks. The Ottomans had been heavily defeated in many Balkan Wars and it was assumed that they would flee at the sight of the superior western navies and armies. A sense of western superiority meant that the Allies failed to recognize the capabilities of the Turks. The Gallipoli campaign was doomed from the start. Too few soldiers were allocated to the landings. To compound this, the Allied intelligence services failed to provide adequate intelligence. For example, they failed to indicate that Gallipoli, was not suitable, for large scale landings because of the nature of the terrain. Then the entire operation was poorly planned with little forethought from logistics or what the allies would do if the Turks were waiting for the invaders at the proposed beachheads. Then there was a complete failure to recognize that the Turks would fight fiercely because they were fighting for their homeland, this is symbolized by the great leadership displayed by the future Ataturk at Sulva Bay and elsewhere. The German commander at Gallipoli also devised a clever strategy but he was greatly helped by the failings of the allies.